With our deep roots in mobile technology we’re not quite sure what to think of the Microsoft Surface series of tablets or the next iteration of Windows, Windows 8. Sure it’s going to be a Microsoft game changer, but are they trying to come in and change a party that’s been going on for the last five years? Microsoft is betting a great deal on the fact that people will come back to the Windows brand on the desktop, the laptop the tablet and the smartphone. They’ve lost a tremendous amount of ground in the mobile sector and have taken their time bringing a tablet to market. Hopefully, they’ve used that time wisely and they’re ready to compete with Apple’s iPad and the onslaught of Android tablets available everywhere. Microsoft has been working hard on making Windows the same experience across multiple screens. Windows 8 integrates well across desktops, laptops, tablets and with Windows Phone 8, phones. They’re hoping to capture a lot more of the mobile market than they have with past versions. Now, after nearly four months of being completely in the dark about pricing and final specs, Microsoft has revealed what you want to know. The baseline Surface tablet will set you back $499. This includes 32gb of memory but no fancy shmancy Touch Cover. A $100 more will get you the 32gb model with the Touch Cover. 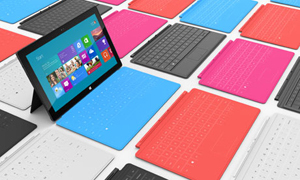 The 64gb Surface tablet will set you back $699 and that will also include the Touch Cover. The Surface is priced competitively with the iPad and several Android based tablets from computer manufacturers like the Lenovo IdeaTab Lynx. The Surface Tablets are available for preorder now and will be shipped October 26th. Microsoft is reporting that on launch day the Surface tablet will be available at Microsoft branded stores across the country and 34 pop up stores in malls across the country. While Windows 8 will be widely available on October 26th, including at Best Buy and Walmart, there is no word on when the Surface tablets will make it to Microsoft’s retail partners.